Sounds great, I like all the actors involved..
Clint Eastwood is returning to acting after six years of keeping his talent behind the camera. 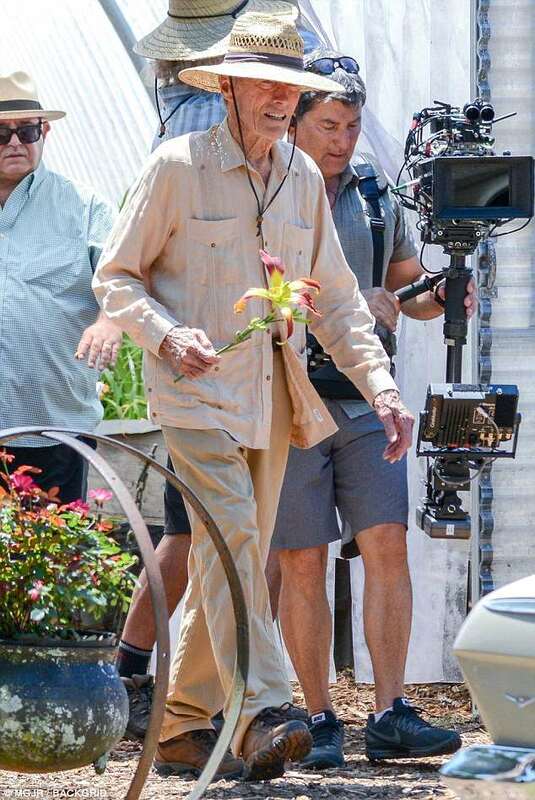 The legendary tough guy 88, was spotted filming his new project The Mule in Augusta, Georgia on Monday, where he looked breezy while carrying a flower around during the outdoor shoot. Eastwood, who is also directing the feature, plays the character Earl Stone, a down-on-his-luck man in his 80s who gets wrapped up in the seedy world of drug trafficking after taking what he thought was just a driving gig. Holly Jesus in the morning...wooow... That is our Clint. I wonder if palooka will have a role in this film? Some more cool shots of Clint. I am a little surprised by how excited the townspeople seem to be about this movie filming in Augusta! All right. Filming finishes on Tuesday in Augusta. Next is supposed to be Atlanta and New Mexico. Cool. It looks like we'll have another Eastwood alumni in this film. Loren Dean, who played Ethan all the way back in 2000 in "Space Cowboys," has joined the cast! Ethan was a bit of an idiot in that film, whose impulsiveness and failure to listen to the old pros put the lives of everyone at risk, so hopefully he will be playing a smarter character as a DEA Agent in "The Mule." They wrapped filming in Augusta today, but may be returning in July. When is the projected release date of this film? If I had to guess, I'd say the same, Antonis, but Warner Bros has Bradley Cooper's "A Star is Born" opening in October, and that's already getting Oscar buzz. Warners may not want to release another movie with Bradley Cooper at around the same time.